East Meets West in Pasadena at Bistro Mon Cheri. 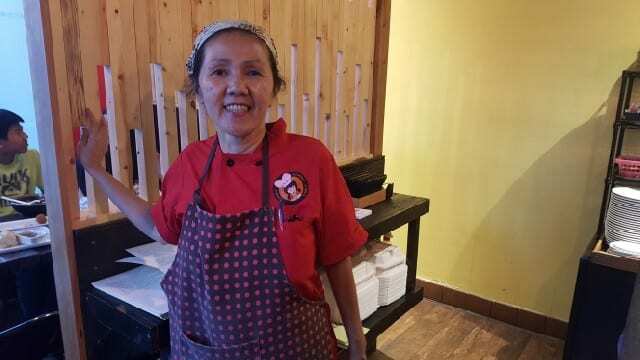 Tucked upstairs in a strip mall overlooking Pasadena’s East Colorado Boulevard sits Bistro Mon Cheri, the newest restaurant by Chef Kimmy Tang. 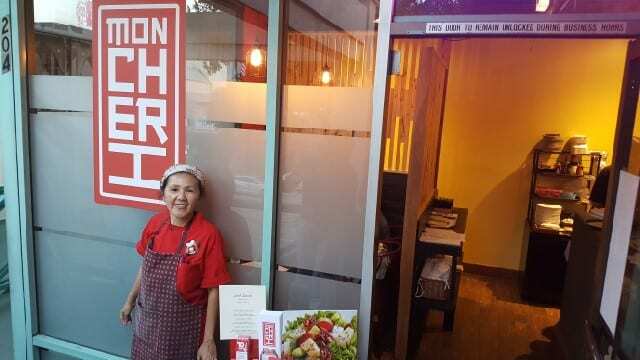 I first met Kimmy years ago in Beverly Hills at 9021Pho where Vietnamese cuisine was met with a California flair. Now at Bistro Mon Cheri, Vietnamese cuisine gets a European touch. 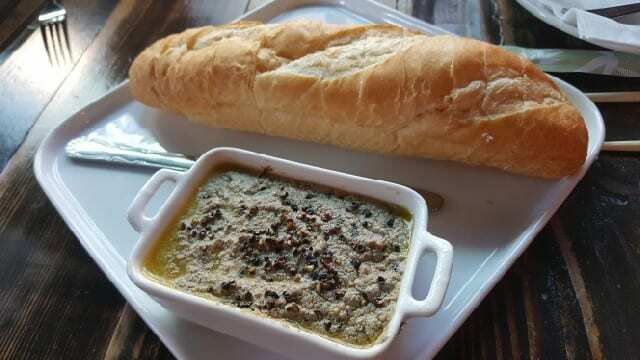 The European influence was immediately apparent with the first dish placed on the table – Paté de foie de canard, a duck liver pate served with Vietnamese baguette. Creamy and rich, it was more French than any other culture. 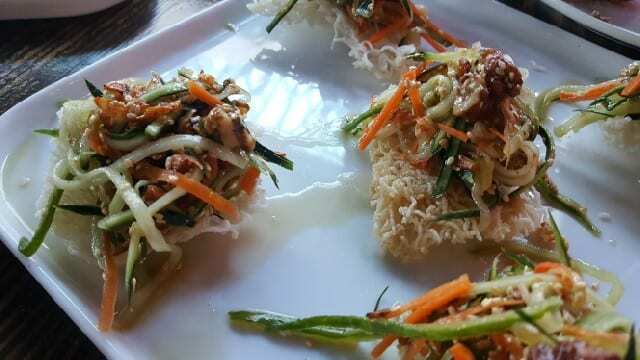 Next up was a more traditional Vietnamese dish – Sakura shrimp salad with carrot strips, cucumber, walnuts, fried shallots and sesame seeds on thin rice noodle crackers. I loved the freshness and lightness of this dish. 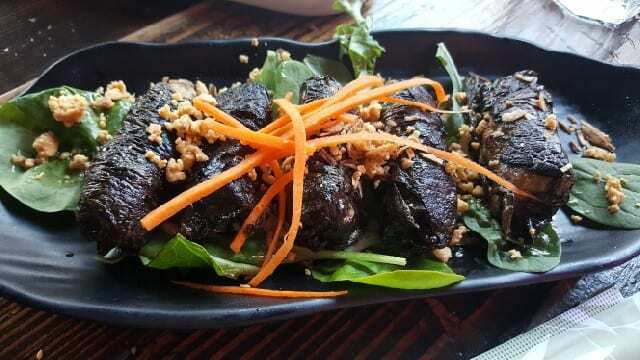 The Beef Wraps, beef wrapped with betel leaf and dressed with Vietnamese Nouc Cham is another Vietnamese dish. The next two dishes showcased Chef Kimmy’s use of ingredients in unconventional way. 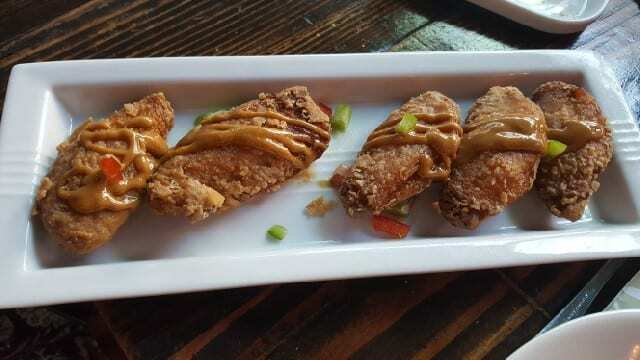 The coffee tori wings are crisp chicken wings drizzled with a smooth, rich coffee sauce. And Chocoliscious are beef meatballs with a crunchy coating. 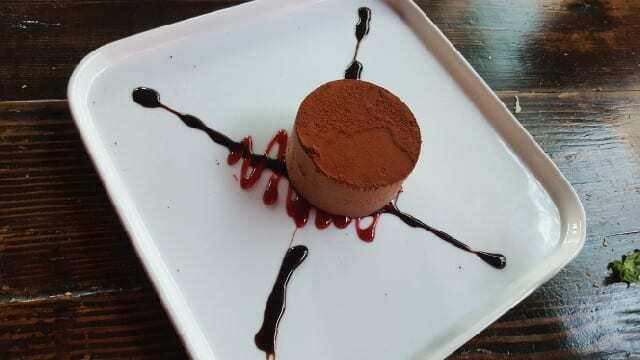 When you bite into the meatball, you will find it filled with chocolate lava sauce. 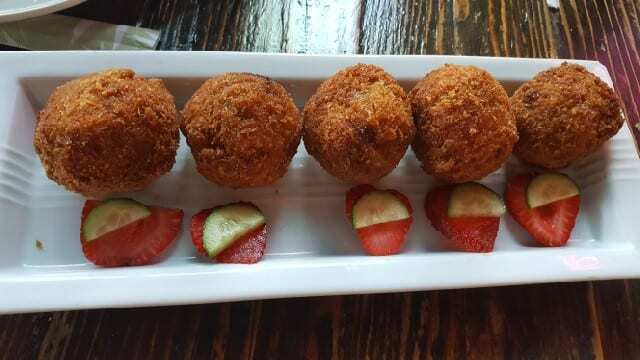 The meatballs are served with cucumber and strawberry slices that are to be included with a bite of the meatball. 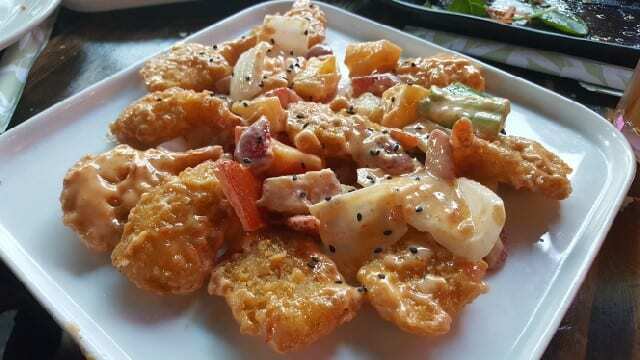 The Shrimp Va-Va-Voom is crispy shrimp with strawberry, pineapple, onion and bell pepper in a French spicy aioli. Between the crunch of the shrimp and the sweetness of the fruit, this is a really addictive dish. 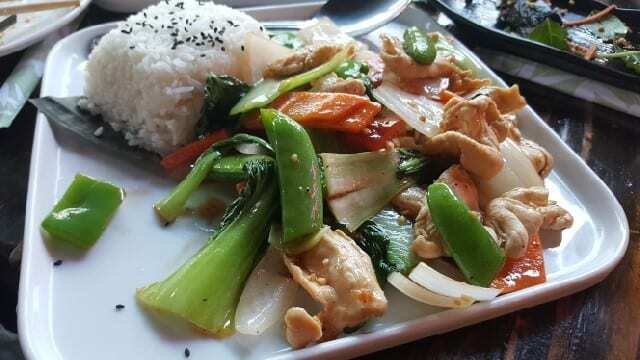 The Lemongrass Chicken and Tofu with onion, bell pepper, mushroom, snap peas and served with jasmine rice sprinkled with black sesame seeds is vibrant and fresh. 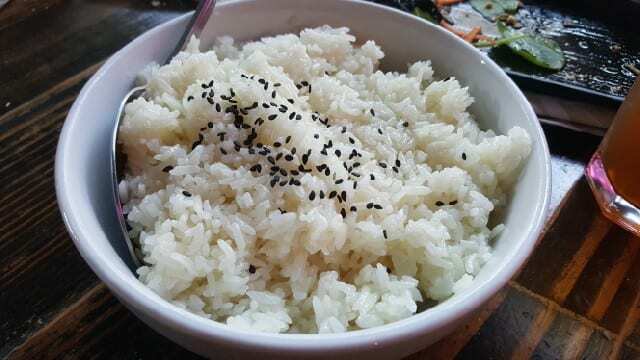 The Coconut Rice is lightly sticky and sweet. Dessert is more European in style with a hazelnut cake with chocolate ganache. Bistro Mon Cheri is where East and West gastronomy meet. The flavors are fresh and bright and Chef Kimmy is always there, in the kitchen, doing the cooking. Bistro Mon Cheri is open Monday to Thursday from 11 a.m. to 3 p.m., then 5 p.m. to 8:30 p.m. and extended to 9:30 p.m. on Friday to Saturday. Closed Sundays. This entry was posted in Food and tagged Bistro Mon Cheri, Chef Kimmy Tang, food, Old Town Pasadena, Pasadena, restaurant, Vietnamese food by Allison Levine.